Police are seeking a man wanted for a string of car burglaries in the Glendale and Middle Village areas. The man broke into three cars over the course of several hours last month. 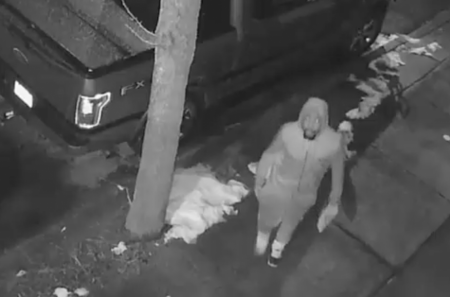 On Saturday March 6, around 7:30 p.m., the suspect allegedly broke the rear passenger window on a car parked near 78th Street and Cooper Avenue in Middle Village. The man stole the 34-year-old victim’s sunglasses and a pair of Bose headphones before fleeing in an unknown direction. Just a few hours later, around 11 p.m., the same man broke into a car parked near 88th Street and Aubrey Avenue in Glendale. He stole an HP laptop belonging to a 49-year-old woman from the glove compartment, and again fled in an unknown direction. Around 3:35 a.m. the next day, he then threw an unknown object through the rear passenger window of a car belonging to a 38-year-old man, parked in Middle Village in front of 79-01 Cooper Avenue. The burglar stole $2,600 from the car and then fled the scene, police said. The suspect is described as 25 to 30-years-old, with facial hair. He was last seen wearing a hooded shirt, sweat pants, and multi-colored sneakers.